AdaptiveCyberCycle Divergence generation III is modern indicator with complex mathematic algorithm (BJF Trading Group innovation). You will see divergenses on the chart and indicator. Arrows painted above/below the open bar and not in the past. You can see when actually you can trade. It is never to late! Signals based on closed bars so the arrows above/below open bar never disappear. 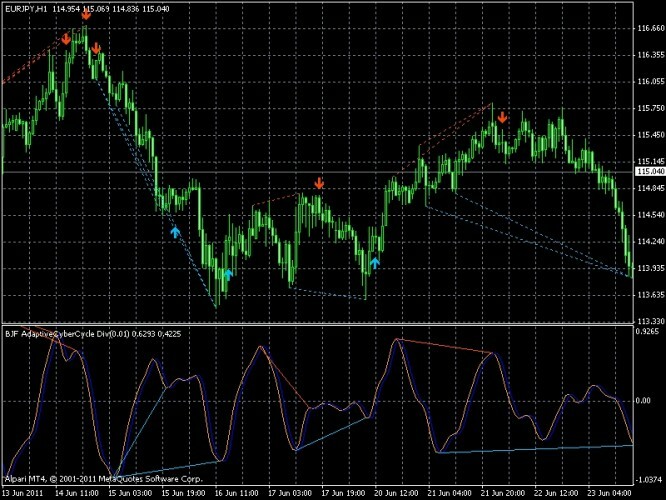 MT4 Indicator AdaptiveCyberCycle Divergence indicates fractal divergence by AdaptiveCyberCycle indicator.When divergence appears between AdaptiveCyberCycle and the price, it indicates a high probability that the current trend will finish soon. A signal to buy is when a new Low-fractal is formed below the previous one and a corresponding AdaptiveCyberCycle value is higher than the previous one. A signal to sell is when a new Up-fractal is formed above the previous one and a corresponding AdaptiveCyberCycle value is lower than the previous value. The indicator has a lot of customizable settings. Adaptive indicators all use the measured dominant cycle Adaptive CyberCycle, Center of Gravity (CG), and RVI all yeild similar results but are more responsive than their static (non-adaptive) counterparts. Adaptive Cyber Cycle Oscillator From the book 'Cybernetic Analysis for Stocks and Futures' by John Ehlers, July 2004. Price - the current price - only used by the Cycle Period measurement, not the Cyber Cycle calculation (except for the first few bars). Length - used by both the Cyber Cycle calculation and the Cycle Period measurement.